A few weeks ago I wrote a piece about how we overvalue championships in professional sports. It got me thinking on another topic: We also need to reevaluate the way we view the Hall of Fame and players who belong in it. I was watching a Los Angeles Chargers game a few weeks ago (awful I know) and the announcer mentioned something along the lines of, "there are 2 future Hall of Fame players on the field today." He was talking about Antonio Gates (which I agree with) and Philip Rivers which puzzled me a little bit. Does Philip Rivers belong in the Hall of Fame? This question transcends all sports. Is Carlos Beltran a Hall of Famer in the MLB? Is Pau Gasol a NBA Hall of Famer? Player A: 48,096 yards passing, 64.2 completion %, 329 touchdowns, 163 interceptions, 100-85 record in 189 regular season games. 2,165 yards, 60.3 completion %, 11 TDs, 9 INTs, 4-5 record in 9 playoff games. 0 Super Bowl appearances. Any guesses who these two quarterbacks are? Player A is Philip Rivers and Player B is John Elway, one of the greatest QBs of all time and a Hall of Famer. Looking at the stats, Rivers has put up better numbers but I have never heard anyone mention these two guys in the same breath. Today's NFL is completely different from when Elway was playing, is that a bad thing and should we punish the guys playing today? Absolutely not, the game is played differently today, just look at this stat: Elway attempted over 500 passes six times in his career, Rivers has attempted over 500 passes the past 8 seasons in a row. So does Philip Rivers belong in the hall with guys like Elway, Aikman, Montana, etc.? I don't think so, he is a great player in today's NFL but is not one of the all time best. We need to reevaluate how we view our Hall of Fame players, they cannot be based solely on stats. The yards passing record gets broken every season and it will continue to do so until the game changes again. Are there NFL QBs who belong in the hall? Definitely. I think of players like Tom Brady, Drew Brees, Blake Bortles (hahah just kidding, keep doing you Blake), maybe Ben Roethlisberger and Aaron Rodgers. How do we evaluate players and figure out who deserves to be in the Hall of Fame then? Honestly I'm not sure, there are a lot of advanced metrics we should be looking at but it makes it difficult to evaluate players with how much the game has changed and continues to change especially being tilted towards offense and passing offense. The NBA and MLB face the same problems as the NFL. The NBA is not as physical as it once was and the rules have changed and made the game more offensive minded then ever before. Rookies are dominating the game like never before, are these guys good players? Absolutely, but they are also playing in a great time to put up monster stats. Another aspect for all of professional sports is players are taking better care of their bodies. In baseball guys aren't eating hot dogs, drinking beer, and smoking cigarettes in the dugout. Tom Brady wrote a book titled TB12 which gives a look at how he has lasted so long at one of the most grueling positions in sports and, for God's sake, he talks about eating avocado ice cream. The technology is helping guys stay in the league longer and prolonging their "peak years." In the NBA look at LeBron, in his 15th NBA season through 14 games he is averaging 38 minutes per game, 28 points, 7.5 rebounds, and 8.8 assists. Uhh are you kidding me? For perspective Michael Jordan played 15 seasons and two of those were with the Wizards. It's incredible what LeBron has done in his career regarding his stats and his "ability" to stay healthy. Coming back to the MLB what should we do concerning the steroid epidemic? 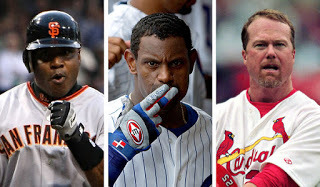 Mark McGwire, Sammy Sosa, and Barry Bonds those guys lit the baseball world on fire but got busted for steroids. Should we discount everything they accomplished? Of course not, I think it's completely absurd these guys are not in the hall. I say, create a separate wing and put players busted for steroids there. Don't get me wrong I think we have a lot of really good players in professional sports right now, look around at some of the jersey's you see people walking around with. I believe we need to reevaluate how we vote players into the Hall of Fame otherwise everyone will get in and it will water down the importance of "being in the Hall of Fame." There are absolutely Hall of Fame players in sports and there always will be but let's not give the honor to everyone.